It’s been a hell of a year for music and the arts in general losing so many wonderful legends. Indeed in the words of her majesty it has been an Annus Horriblus. With the most recent loss being Greg Lake it is fitting that we steer from our normal format of including new releases etc and celebrate classic Prog from E.L.P. genesis,Yes,Pink Floyd, Rick Wakeman, Camel, King Crimson and many more. I am honoured that my Progcast falls on Christmas day this year and whilst listening to my show presents a great alternative to the usual TV fest and post lunch malaise. Why not sneak off to the den and have a couple of hours reprieve listening to some milestones in progressive music as well as some unsuspecting tracks from the seventies onwards. Of course i am not as deluded as i seem and listening to some middle aged dude from the North playing the genre of music that seems to get the most stick will have listeners flocking to ignore the queens speech or halt the exodus the local pubarama or family gathering. Therefore the Mixcloud archive of the show will be available early the following week so please listen in and enjoy some classics that will make you smile. May i take the opportunity to wish all of my listeners and followers of The Progmeister site a very happy and peaceful Christmas and a prosperous new year. And to thank my cohorts at team Progmeister Phil Swinburnw, Bob Mulvey and Prof Richard Popple. Without them i would be sunk. My heartfelt thanks to them for their expertise, knowledge and patience. Diamond geezers each one. Click on and tune in when you get the chance. 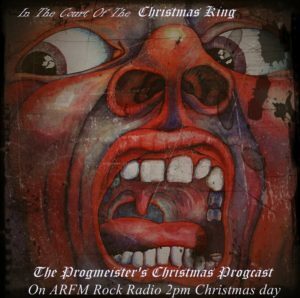 Sunday Christmasday 2pm – 4pm for the last Progcast of 2016 0n ARFM Rock Radio.